It's so wild to see my love print on TV for the first time....and on the Nate Berkus show no less! Even though I didn't VENTURE out to NYC for the INFAMOUS blogger Nate Day event, I am grateful to have my product featured on his show! Made By Girl was featured in the Hottest Trends of 2011 segment. You can WATCH the video here. It's actually WEIRD because my print has been featured on so many blogs & is just now brought to mainstream. But that's usually how it works, we bloggers usually discover all the interesting trends first! 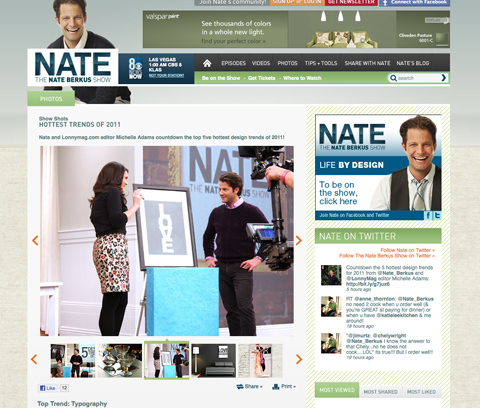 Thanks to Nate Berkus & Michelle Adams (whom I love!). The PRINT is a simple print. I made it because it is a feeling I can't LIVE without. It doesn't need anything else beside it, just the one word is sufficient as a reminder of what we all should strive to experience....LOVE.